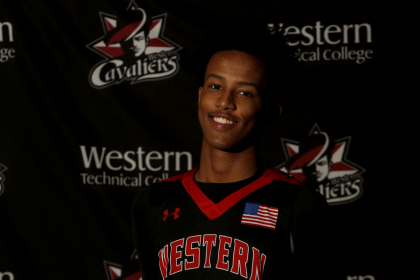 Western men’s basketball player Kadar Farah has been named to the All-Southern Division Team by the Minnesota College Athletic Conference (MCAC). Farah, a forward for the Cavaliers, averaged 11.6 points-per-game this season in 25 games played. He also earned 7.0 rebounds-per-game and shot 38.4 percent from the field during the season. The men’s squad finished 7-7 in conference, and 12-13 overall.